It’s day two of Interchange Madrid (read day one's recap here) and there is still an excited buzz in the air (or maybe that’s from that third glass of sangria…). Today was chock-full of activities and sessions sure to leave you with a notebook full of ideas, new insights to bring back to your team, a better understanding of the Ivanti products you already own, a desire to automate using Ivanti Cloud, and quite possibly, a hangover. In case you missed it or want to relive the moments, here is a recap of day two of Interchange Madrid. During the keynote, Steve Morton was joined by Raphael Ax, IT Manager for Software Distribution for ALDI International Services. When most of us think of ALDI, we think of a simple, budget-friendly shopping experience. Raphael pulled back the curtain on what is happening behind the scenes in ALDI’s IT department. His department of five people manages 60,000 endpoints. Let me just repeat that. Five people, 60,000 endpoints. Yikes. This is made possible by the talent of his team and the aid of Ivanti security products to minimize the time needed for patching systems. Raphael focused on how his department uses ALDI’s core values to dictate the decisions they make as a team. The three values are simplicity, accountability, and reliability. As ALDI strives to meet these three values in the experience they provide customers, the IT department strives to deliver a user experience that echoes these values. “Whatever we do in IT, it needs to be as simple as possible,” Raphael said. In the last section of the keynote, Senior Analyst at Forrester, Martha Bennett, joined Steve Morton for a great interview. Martha has been an analyst since the nineties after working in enterprise IT. She specializes in new and emerging technologies. “It’s all about what technology is coming down the line and what does that mean for the business, both as opportunities and challenges,” Martha said. She spoke about how many job profiles are changing in IT with cloud adoption and how there is a new focus on continuous learning with the amount of new technologies introduced. “We are at a point where business people are more tech-literate than ever before, but that doesn’t mean everyone is an expert,” Martha said. She closed the keynote by giving advice for women in technology and by sharing her predictions for the future of IT. Speaking of the future of IT, Martha hosted a breakout session all about this topic later in the day, which I had the privilege of attending. In the session, she discussed competing in the digital era by shifting your thinking to outside-in thinking. She presented Forrester’s 12 emerging technologies to watch and showed data about the rising expectations of technology to drive innovation. She also reminded us that CIOS and their teams must shift from delivering tech solutions to delivering business outcomes. Besides the two parts of the keynote session I’ve already mentioned, we had a few other elements of the morning meeting that I wanted to highlight. We had a fascinating discussion about the changing relationship of the CIO and the CISO during an interview with CIO Keith Lutz and CISO Phil Richards. We talked about the common language between the groups and how they can best align. They also discussed at length the importance of scenario planning with representatives from the whole company so your team is prepared for incidents. “It is crucial to figure out how you’ll handle an incident before the pressure is on,” Phil said. We also had more demos featuring Ivanti Cloud from CTO Tom Davis and VP of Product Duane Newman. They showed patch intelligence in action with Ivanti Endpoint Security and Ivanti Security Controls. Through these demos, they showed how Ivanti Cloud can provide insight to preserve better security and trusted ownership. There was also a presentation from Director of Product (ITxM) Ian Aichison. He showed how IT Service Management, IT Asset Management, and Identity Management can work together in the cloud. “No discipline that we have at Ivanti impacts the users more than ITxM,” Ian said. Like yesterday, we offered almost 40 different breakout sessions for attendees today, all covering different products, use cases, and pieces of IT strategy. Some of these included the State of the Union address for Ivanti Cloud, the session on the future of IT I mentioned earlier, the path to unify IT, and five new habits of the successful IT organization. We also hosted our famous monthly Patch Tuesday webinar as a live breakout session! 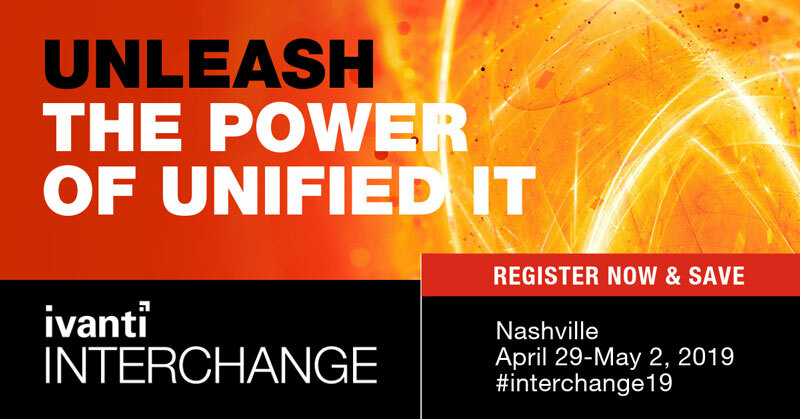 Stay tuned tomorrow for my conference wrap up post and be sure to register to attend Interchange Nashville later on next month. Follow @GoIvanti on Twitter or search the hashtag #interchange19 to get conference updates from attendees, customers, partners, and Ivanti employees from around the world.